Liberty University President Jerry Falwell Jr. (right) praised President Trump for his "bold truthful statement" about Charlottesville. By contrast, Trump's religious advisers have been mostly silent — with a single notable exception. A.R. Bernard, pastor of the Christian Cultural Center megachurch in Brooklyn, New York, announced on Friday that he has resigned from the president's Evangelical Advisory Board. "It became obvious that there was a deepening conflict in values between myself and the administration," Bernard announced via Twitter. Bernard said he had "quietly stepped away" from his involvement in the advisory group "several months ago" and formally resigned on Tuesday. 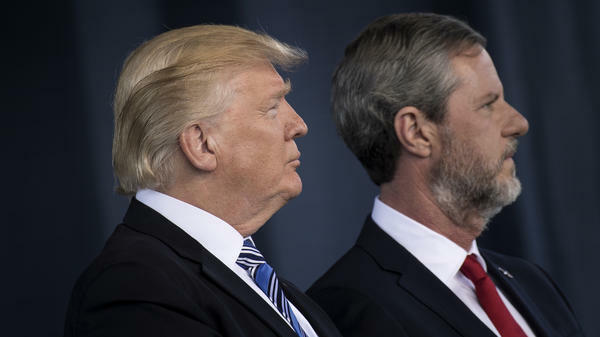 As of Friday, none of the remaining 24 members of Trump's evangelical group had resigned, and their failure to take a stronger stand against the president had exposed them to withering rebukes. When Matthew Dowd, chief strategist for George W. Bush's 2004 re-election campaign, tweeted that "corporate America has a greater moral compass" than the evangelical group, the comment was retweeted nearly 50,000 times. Such criticism put many of Trump's evangelical advisers on the defensive. "We believe it would be immoral to resign," says Johnnie Moore, a lay evangelical leader who has served as an informal spokesman for the Evangelical Advisory Board. "As faith leaders, we have been given an opportunity to speak directly to various members of the administration, to provide not just policy counsel but personal counsel. We're personally involved in the lives of all these people, praying for all these people, and answering their questions." In announcing his resignation, Bernard said he had agreed to serve on the advisory group because he thought he could play a useful role. "In a social and political climate such as ours," he wrote, "it often takes a gathering of unlikely individuals to shape the future of our nation on issues of faith and inner city initiatives. I was willing to be one of those unlikely individuals." Whether other members of the advisory group are likely to follow Bernard's example is unclear. Many were with Trump during his campaign and supported him politically. Trump's business advisors, on the other hand, came from a more diverse background and had fewer political ties to the president. Business and religious leaders may also see their responsibilities differently. Corporate officers are especially sensitive to public pressure, because they have to worry about alienating their customers or angering their stockholders. The haste with which many U.S. corporations respond to consumer boycotts is an indication of their sensitivity to public sensibilities. Religious leaders, meanwhile, may see their role in more private terms. "Most evangelical leaders, including those who advise the White House, have been focused on ministry in recent days," says Moore, who has advised several public figures on outreach to Christian communities. "Politics has been the last thing on our brain. We've been reaching out, doing what the Bible calls us to do as ambassadors of reconciliation, reaching across the aisle, [and] reaching out to other ministers." Many conservative evangelicals, however, did not hesitate to criticize Barack Obama or Bill Clinton when they objected to their policies or felt their presidencies were tainted, so the reluctance of Trump's advisers to address his comments has been noteworthy. Some have had nothing at all to say about either the Charlottesville rally or Trump's response to it, while several others rushed to the president's defense. Jerry Falwell Jr., president of Liberty University, praised the president for his "bold truthful statement" about Charlottesville. Mark Burns, pastor of Harvest Praise and Worship Center in South Carolina, retweeted a link to a television interview in which he declared his support for Trump and criticized the counterprotesters. Robert Jeffress, pastor of First Baptist Church of Dallas, blamed the news media for misrepresenting Trump's comments. Other members of the president's advisory board limited their critical comments to the neo-Nazis and other racists in Charlottesville. Ronnie Floyd, a past president of the Southern Baptist Convention, issued a statement saying that "white nationalism and white supremacism are anathema to the teachings of Christ. ... As Christians, we do not tolerate or condone these protests." Such comments went well beyond the president's assertions that "many sides" were responsible for the violence in Charlottesville and that the torch-carrying marchers included some "very fine people," but the evangelical leaders have clearly been reluctant to challenge Trump directly. Bernard announced his resignation from the advisory board only after the resignations from Trump's business advisory group received considerable public attention. The Brooklyn megachurch pastor is the second member of the Evangelical Advisory Board to resign since its formation last summer. James MacDonald, pastor of Harvest Bible Chapel in suburban Chicago, left the board in October, and in the intervening months he has clearly distanced himself from Trump. Preaching about Charlottesville last Sunday, MacDonald said he didn't want "to call people out by name," but he left no doubt what he thought of the president's comments on the rally and the violence. "The greater your influence," he wrote in a Facebook post, "the greater your complicity, if you don't call the Charlottesville attack what it really was: a heinous act of domestic terrorism entirely rooted in racial hatred."